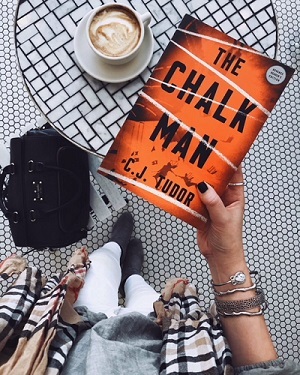 Happy publication day to THE CHALK MAN by C.J. Tudor, an exceptional debut thriller that is bound to be one of my favorites of 2018! From its horror-inspired premise to its chilling atmosphere and masterful plotting, THE CHALK MAN is poised to be an instant-favorite for fans of Stephen King, Stranger Things, and psychological thrillers with the rich character development of Liz Nugent and engaging plotting of Ruth Ware. C.J. visited New York this fall, and I had the chance to sit down with her and ask her a few of my most pressing questions about THE CHALK MAN - and I’m delighted to share our interview with you today! A video introduction from C.J. herself! A transcript of my interview with C.J. Tudor! Many thanks to C.J. for taking the time to chat with me about her book, and to Crown Publishing for facilitating this interview! THE CHALK MAN is on sale now - and comes highly-recommended from CBTB! Meet C.J. Tudor, Author of THE CHALK MAN! Crime by the Book: If you had to describe your book in three adjectives, which would you choose? C.J. Tudor: Creepy, creepy, creepy! No, I won’t do three creepy’s! Creepy, twisty, and… whatever one word is for a coming-of-age story! CBTB: This is your debut novel - congratulations! Has this been a longstanding dream of yours, to be an author? How did this come about? CJT: You know, I think I’m like a lot of debut authors in that I’ve been writing for about 10 years, and I have a lot of failed projects - and I’ve gotten close, but not quite got there, and have had a lot of rejections along the way as well. But this one actually came about quite quickly! I had an idea, and I just started writing it and it just kind of fell into place. CBTB: So this wasn’t your first story idea? You’ve had others before it? CJT: Yeah, exactly! So the book that’s going to be my second book, actually, I started writing before I wrote THE CHALK MAN. And at the time I wasn’t quite sure what direction I was going to take it in, and then I had the idea that became THE CHALK MAN - and that one came to me almost fully-formed, so I thought “okay, let’s just go write this one first. I can always go back to the other one - let’s see how this one pans out.” So the idea for Chalk Man came very quickly, but only after years of having other ideas. But those other ideas are all there! CBTB: Do you think you’ll come back to those other ideas eventually? CJT: Yeah! Not all of them have worked out in the direction I wanted them to go, but there are still bits of them that I’d go back to. I’m a great one for saving - I never like to get rid of anything. Even a paragraph that I’ve really liked! I don’t want to waste it. CBTB: One of my favorite things about this book is the almost “urban legend” feel the story has to it, with the story’s “chalk man.” I was wondering, where did this idea for these “chalk men” come from? Was drawing these chalk men something you and your friends used to do in childhood? CJT: The way it came about is, a friend of mine bought my daughter a bucket of chalk for her second birthday. And we went outside the next day, and my daughter wanted to draw on the driveway, and she started drawing these stick figures in different colors doing all different things. We covered the driveway in these stick figures and weird little symbols, and then we went inside for the evening. And later that night, I opened the door to let the dog out, and the security light came on, and there were all these weird little figures all over the driveway! And I called out to [her partner] Neil and said “Neil, these chalk men look really creepy in the dark!” Because they really looked so sinister. They were so innocent - but they looked so sinister. That was where the idea came from - and I started writing the book the next day. CJT: Yeah, there’s that fine line sometimes - like a doll for example. Things that are innocent and should be lovely… but they’re not. Fairgrounds, clowns, dolls… there’s that strange line between things that are innocent and fun on the one hand, but then they can also be really, really creepy. CBTB: You previously mentioned this story’s coming-of-age element - THE CHALK MAN centers around a group of young kids. Do you identify most closely with one of them? Is their development into adulthood inspired by any personal experiences, or is this totally fictional? CJT: Although each character is as a whole fictional, I think there are little bits and pieces - words, sentences, jokes - that I remember from my childhood. And the dynamic is very similar to some of the groups of friends I remember growing up. When you have a little “gang” growing up, there’s often a couple people who are closer, and maybe there’s some tension between others. Whether it’s boys or girls or mixed groups, you often get those dynamics, and that’s something I remember very clearly from growing up. I suppose I do identify with Eddie a bit as well - there’s something about the fact that I was quite an obsessive kid - I would get obsessed about things, and we do share that quality. I did also love collecting stuff - weird stuff we’d find when we were out. My friends and I would also take our bikes and we would cycle through the woods near our houses and scare each other. There was always a story of “oh, there’s a man who was seen creeping through the woods” or something like that - little stories that we would tell to scare each other. So those are all things I do remember from being at that age! It’s a slightly weird period. You’re not a child but part of you wants to be a child still, but you’re not really a teenager yet, either - it’s a real no-man’s land, and there’s also a shedding of innocence in that period, too. CBTB: I love what you just said about this period of life being one where kids are “shedding innocence” - and in that vein, your story is pretty dark! 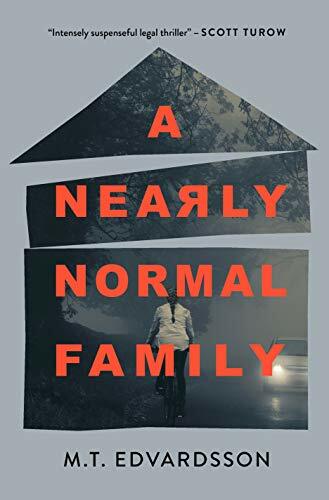 I have to say I was surprised going into it - you kind of hit readers over the head, almost literally right at the beginning, with real darkness. You’ve already touched on themes of childhood in our discussion - could you speak to your decision to blend dark topics into a story centered largely around childhood? CJT: You know it’s funny, I was just thinking about this before - I think that being a child can be quite an adult period, because I think particularly at that age, there’s a lot of stuff going on - firstly, I think children can be quite dark creatures - at that age you’re still finding your moral compass. Think about things going on at school - you have this little world that’s completely your world. At school, with bullying, a lot of children can remember there being a kid at school they were scared of. And a lot of children can do horrible things to one another, too, things that as an adult, you’d practically get the police involved if it happened to you. Kids can be incredibly cruel. So being a kid can be quite a fearful world. Also, as children, we are quite attracted to dark and scary things. Kids like scaring themselves. They want to find something bad, they want to go out and see something creepy in the woods. There’s that attraction to dark things as a child. You’re kind of drawn to it. CBTB: If you were to describe Eddie as though you were describing a friend, what would you have to say about him? CJT: I would say that he’s well meaning in his own way. He does want to do the right thing, but he’s quite a flawed character and sometimes wanting to do the right thing doesn’t always equate to actually doing the right thing. So a lot of the stuff he does doesn’t actually work out, perhaps. At heart, he’s a good man - but he’s got a flawed personality and traits that are a bit strange and quirky. He’s still a likable character - he doesn’t set out to do bad things, but sometimes bad things seem to happen as a result of what he does. He’s flawed, but not inherently bad. His heart is good. CBTB: So he’s a person! CJT: Exactly! We are all flawed. And who wants to read about characters who are lovely and perfect and nice? CBTB: Exactly. That’s not compelling! CJT: And that’s not people. We’re all a mixture of good and bad and grey area and that’s just people. And I don’t think people are interested in the person who does everything right. We want to read about real people who make mistakes. CBTB: Do you read crime fiction when you’re not writing crime fiction? CJT: Yes! I read a lot of thrillers - anything creepy, thrilling, I’m interested in it! I read some speculative fiction or sci-fi as well. Horror too! It’s fair to say I don’t read a lot of romance - not a lot of light and fluffy reads. I’m a huge Stephen King fan! I was reading Stephen King when I was about 9, I think. I was a little bit early! I should’ve been reading Judy Blume, but I was reading Pet Sematary! He’s such a huge influence on me. I think Gillian Flynn is great. Val McDermid is great as well, as is Michael Marshall. He writes really dark fiction with dark humor, and he writes really well about the human condition as well. I’m a huge fan of his, too. Pretty much anything that’s a bit dark and scary! CBTB: What’s next for you? Will you have another crime novel releasing in the future? CJT: I’ve finished book two pretty much, I’ve got a few more edits. That was the book I started before Chalk Man, and it’s now being finished! It’s pretty much all there now. If you enjoy THE CHALK MAN you’ll see it’s in the same family even though it’s quite different in many ways. It shares the same DNA. But very different in its story line. It’s twister and creepier - I turned the creepy up to 11 for this one! Many thanks to C.J. 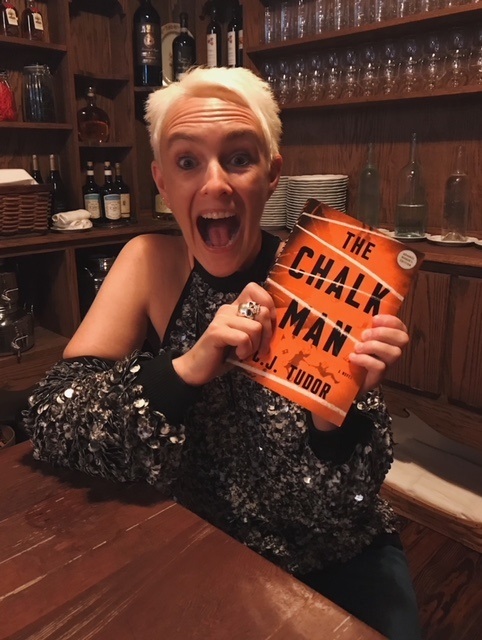 Tudor for taking the time to sit down and chat with me about THE CHALK MAN - I highly recommend this read, and can’t wait to see what she’ll do next!